We all know that Earth’s resources are limited and we have a responsibility to protect the world in which we live. But sometimes it’s hard to break habits, and it’s not always easy to know how to start living in a more eco-friendly fashion. Here are some suggestions and easy changes towards a more eco-friendly style of living. Recycling is extremely important and very easy to do. Recycling bins are available on the street, in malls, in coffee shops and pretty much everywhere you go. So, before you gather your garbage and leftovers in one pile and throw it in the trash, consider recycling what you can. And at home, most buildings will either have a recycling room or a slot beside the garbage. If you live in a house and don’t have a blue box or other recycling bin, then you can easily gather up all your recycling-worthy materials in a clear plastic bag, the same one that’s sometimes used for raked leaves. While there’s a two-bag per household limit for garbage in Ontario, for example, there’s no limit to your recycling bags or boxes. Plastic is highly toxic for the environment, and for us, too. Try to avoid using them. A lot of stores have switched to paper already; when you shop in one that doesn’t have paper bags, bring your own. 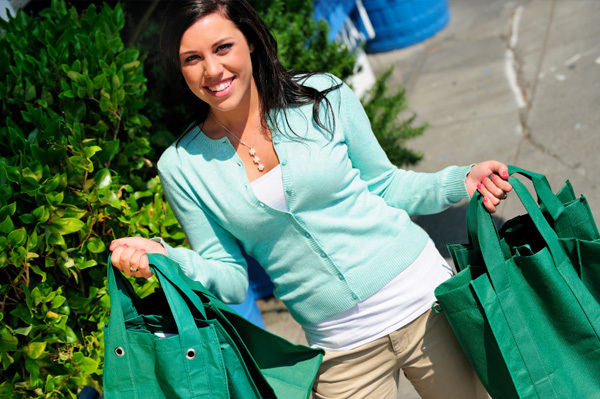 Invest in a few cloth totes or any other eco-friendly bags for grocery shopping — you’ll reduce clutter in your home, as we all tend to hold on to our array of plastic bags for future use. Another way of controlling plastic bag usage is by eliminating them from lunches. Ziplocs and snack bags can be replaced by small containers and brown paper bags for the same cost and convenience. Substitute aerosol spray deodorant for roll-ons and gels; they are much better for your skin, not just the ozone layer. Another switch can be done in air fresheners. Instead of buying spray cans, try candles and liquid air freshener (the ones you plug in). They are less concentrated but they last longer. They are also milder for those with sinus pain or allergies.